With Buildings dating back to the 1500's, Barn Farm is a traditional Derbyshire gritstone stock farm, in one of the prettiest villages in the Peak District. Overlooking the beautiful Derwent Valley, the farm is a haven for wildlife including badgers and rare Black Fallow deer. It boasts over 60 species of birds such as Nuthatch, Dippers and Peregrine Falcons. Located 3 miles south of the historic market town of Bakewell and three miles west of Matlock, Barn Farm is ideally situated to access the diverse array of local attractions. It borders the mystical Stanton Moor with its Victorian stone carvings and ancient Nine Ladies stone circle. Robin Hoods Stride and other bouldering and climbing areas are nearby and the area is excellent for walking with the Limestone Way long distance path passing close by. Birchover has a village shop and two pubs which serve food, one of which is the famous 'Druid Inn'. 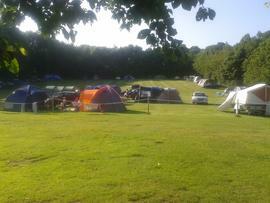 Barn Farm provides camping and hardstanding touring pitches with good shower, toilet and laundry facilities. 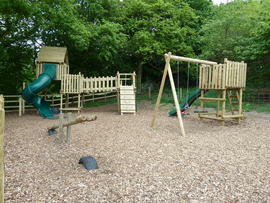 Barn Farm has an outdoor children's playground, indoor games room, shop, sauna and sunbed on site. Barn Farm also has five camping barns. Sabine Hay Barn sleeps 15 in triple bunkbeds arranged around a communal space with fully fitted kitchen with table and chairs. 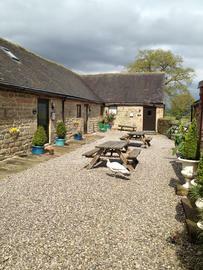 Hill Carr Barn has a similar arrangement and sleeps 12 in single beds. Warren Carr Barn sleeps 12 in single beds with a similar arrangement to the other two but also has its own Bathroom. Stables Barn sleeps 6 in bunkbeds with a similar arrangement to the other three barns but has an adjacent bathroom. The Gatehouse Barn has a double bed/lounge area and separate kitchen and bathroom. All bunkhouses are heated. From the A6 between Matlock and Bakewell take the B5056 signposted Youlgreave and Ashbourne. Take the next left and follow signs for Birchover. Once in Birchover continue past the Druid Inn and the Red Lion to the top of the village where you will see the farm sign. We have a different tariff for midweek, bank holidays and Carnival weekend - please contact us for more details. 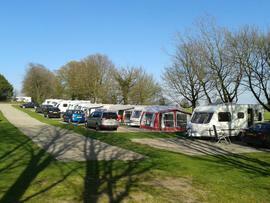 Tourers are £22.00 per night. We offer a reduced price of £17.00 per night for 7 nights or more. Barn Farm is open from 1 April to 31 October.